Last week, I was thrilled to spend the afternoon with Dr. Emmanuel Mignot and Watson (Dr. Mignot’s chihuahua living with narcolepsy with cataplexy). Together, we recorded Project Sleep’s first Facebook Live video at Stanford Medical School. In this “Ask Us Anything” FB Live video, we fielded a wide variety of questions from the future of narcolepsy research to how other dogs respond when Watson has cataplexy. Watson Joins Narcolepsy: Not Alone Campaign! We were thrilled to give Watson some special Narcolepsy: Not Alone gear designed especially for him by the Scher Shop on Etsy! Narcolepsy: Not Alone is Project Sleep’s campaign and photo series raising awareness of narcolepsy around the world, including photos from all 50 U.S. states and 48 countries around the world! Of course, we had a lot of fun taking photos with Watson! Thank you to everyone who submitted fantastic questions, tuned in live and watched the video. Special thanks to Paul, Briana, Dr. Mignot and Watson for making this a day I will cherish for the rest of my life. Sleep has become more of a luxury as the days pass by. It is quite common now to keep on losing sleep each night or sleep at different hours of the day, not necessarily at night. Modern life has tweaked our sleeping habits a lot and it is taking its toll on our body. It is seldom for the average adult to sleep well through the night because there is a myriad of distractions asking for your attention. 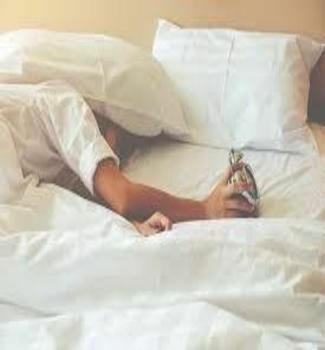 Smartphones and other smart gadgets are too addicting since you can do a lot of things with it that you end up wide awake until the wee hours of the morning without feeling sleepy at all. Not getting enough sleep is doing our body a lot of harm than you can ever think of. It affects you physically, mentally, emotionally, etc. People who always lose sleep or don’t get to sleep at night loses focus, easily get into accidents, perform poorly at school or at work, irritable and moody, and may be suffering from many other health conditions that are predisposed by sleep deprivation. The body is like a machine that needs all its parts working together in order to function efficiently. Similar to the way gadgets are recharged, the body needs sleep to help it keep on going day and night. Regular poor sleep increases your risk of obesity, heart disease and diabetes. You’re also more likely to develop depression and anxiety if you don’t get enough rest. You could get a better night’s rest, and lower your risk of neck pain, by making some changes to your pillow, it’s been revealed. You could be waking up in the night because your pillow is causing a sore neck or shoulder pain, according to Harvard Medical School. It may be due to your pillow being too high, and you’ll be better off with a softer pillow. It’s best to find a pillow that supports the natural curvature of your spine. Alternatively, try using a feather pillow, which easily changes to the shape of your neck. What if my Toddler is Afraid to Poop? It sounds like a funny phobia to grownups, but the truth is, using the potty can be a harrowing experience for toddlers. In today’s video, I’ll explain why the experience can be distressing for some young kids, and give you some tips to help them overcome their fear. – Hi, I’m Dana. Welcome to this week’s video. Have you ever watched the Dr. Oz show? If you have, you’ve probably seen him talk about something not most people don’t really like to talk about, and that is going number two. So when you are potty training your child, and I’m just gonna call it like it is today people. We have to get over it, right. When you’re potty training, a common problem is that your child becomes afraid to go poop. And I don’t know why but this tends to happen more in boys than it does in girls. I don’t know why. I can tell you both my sons went through this little phase, so I get it. And it’s hard as a parent because you don’t want them to be traumatized by this, right, and you’re worried, and you wonder what can I do to make this easier. So let me share a few little tips with you today. The first tip is to be patient, right. Potty training is a process. This is a skill set. We are not expecting children to master this within a few days. It’s gonna take time. Usually the pee comes before the poo and they figure that one out and they’re still stuck a little bit with this number two. And that’s okay. And we’re not gonna put a lot of pressure on them, and we’re not gonna get too uptight about it. We’re just gonna go with it and be patient at first. A new study by investigators at Brigham and Women’s Hospital determined the prevalence of sleep apnea among 852 African-American men and women living in Jackson, Miss, and participating in the Jackson Heart Sleep Study. Researchers explored sleep apnea predictors and estimated the proportion of undiagnosed cases. They found a high prevalence of sleep apnea among this large sample of African-American men and women, and the majority—95%—were undiagnosed and untreated. Results are published on Sept 5 in the journal SLEEP. Researchers found that among 852 adults in the study, 24% had moderate or severe sleep apnea, but only 5% had been diagnosed by a doctor. Men had a 12-15% higher prevalence of the disorder compared to women. Habitual snoring, higher body mass index, and larger neck size were important markers of sleep apnea. The average age of the study sample was 63 years old—66% of participants were female and 53.8% college-educated. “There is a large burden of untreated sleep apnea in the population. Our results point to the opportunity to improve sleep apnea screening and diagnosis in the population as a means for reducing health disparities,” says Susan Redline, MD, MPH, senior physician in the Division of Sleep and Circadian Disorders at BWH and senior author of the study. Today, I want to share a very succinct, very simple, and very important bit of parenting advice I got from an unlikely source when my first child was a toddler. The post The Best Parenting Advice I Ever Heard appeared first on The Sleep Sense Program by Dana Obleman. You feel like you can conquer the world as long as you have enough sleep. It may sound a bit too much for some but that is exactly the case. You feel energized and have the enthusiasm to go about your day if you wake up feeling well-rested after a good night’s sleep. And it is becoming more and more of a rarity as the majority of the population often suffer from chronic sleep deprivation because of our modern lifestyle and diet and our preoccupation with technology. You may sleep at night (some even sleep during the day) but feel even more tired waking up. You probably are sick and tired of this feeling and just want to enjoy sleep like when you were a child. Sometimes, the problem is just around you. It is not always a health condition that prevents you from fully snoozing when you should be. The problem may be with your bed or your pillow. Yes, your own pillow. And it makes sense seeing that it’s the pillow that cradles your head in bed and provides you the comfort you need as you sleep. When is the last time you replaced your pillows? Did you know a pillow is supposed to be replaced every 36 months? And that your body temperature must drop one degree to fall into deep sleep? One top-rated pillow which uses new robot-developed smart technology to promote deep sleep can now help you feel better every morning. More importantly, this pillow always stays cool. Many pillows on market claim they give you support and made of memory foam, but the problem is that the memory foam absorbs heat. A common complaint is that it makes you sweat and prevents you from sleeping.